Parents and caregivers are the primary religious educators of their children. 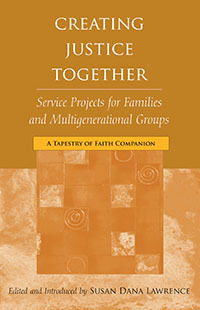 This collection of multigenerational service projects from the Tapestry of Faith curriculum series, suitable for families and other multigenerational groups, helps adults engage with children in practicing and exploring a living faith that is active, expresses caring intention, and changes the world. Each project offers a conscious, intentional experience for all ages, from cooking in a homemade solar oven, to writing to a soldier serving overseas, to making a welcome kit for a new neighbor. Each project guides adults and children to connect experiences with values and to share or journal reflections so that growth in faith can be rich, personal, and long lasting. Susan Dana Lawrence is the managing editor for the Faith Development Office of the Unitarian Universalist Association. She is also a writer and educator who has worked in broadcast television, corporate communications, and print journalism. She belongs to Reform Jewish and Unitarian Universalist faith communities.